← THE STATEMENT OF THE COMMISIONER FOR HUMAN RIGHTS OF THE rEPUBLIC OF AZERBAIJAN ON THE 24TH ANNIVERSARY OF THE TRAGEDY OF JANUARY 20,1990. Turks,Azerbaijans and friends of Azerbaijan commemorate Armenian Khojaly genocide victims in Fort Lauderdale. The Florida Turkish Center in Fort Lauderdale on Saturday evening, March 1,2014 commemorated the cruel Armenian genocide of innocent Azerbaijan civilians at Khojaly. Following an introduction by Ms. Tohfa Eminova,President of the Florida Azerbaijan Association,Mr. 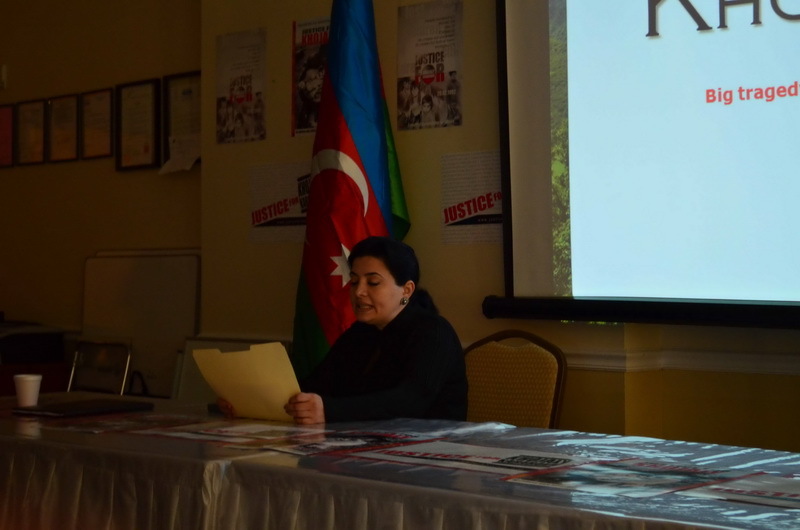 Samir Bejanov,Political Officer of the Embassy of the Republic of Azerbaijan in Washington DC, provided the audience with a comprehensive report illustrated with slides and a video presentation of the actual sequence of events surrounding the Khojaly genocide. The large number of question from the audience during the question and answer period, following Mr. S.Bejanov’s presentation,showed how much the talk had impressed the audience. The informative event at the Florida Turkish Center in Fort Lauderdale was concluded with Azerbaijan food and refreshments.